Reader Joel left a comment on my blog post The Case Against Roth 401(k) and asked about a study by Harvard and Yale professors which concluded that Roth 401k makes people have more money in retirement than Traditional 401k. The study was done with 401(k) plan data from 11 companies from 2006 and 2010. Four professors, 3 from Harvard, 1 from Yale, published a working paper in 2015. It was finally published in an academic journal in July 2017. Here’s the formal citation with a link to the full paper. Beshears, John, James J. Choi, David Laibson, and Brigitte C. Madrian. “Does Front-Loading Taxation Increase Savings? Evidence from Roth 401(k) Introductions.” Journal of Public Economics 151 (July 2017): 84–95. I read the 43-page paper. I agree with the authors. Roth 401k makes people have more money in retirement. However, it does not contradict with the case against Roth 401k. Roth 401k makes people have more money in retirement when people would otherwise contribute the same percentage of pay to Traditional. It does so at the cost of a lower take-home pay. When people are OK with a lower take-home pay, bumping up contributions to a traditional 401k would make them have even more money in retirement, but for some reason people find it easier to shift contributions to Roth while keeping the contribution rate the same than to increase their contribution rate to Traditional. We are not talking about people who max out their 401k contributions. Data from Vanguard shows that only 10% of all 401k participants contribute the annual maximum set by law. The vast majority can increase their contributions to Traditional but they don’t. They choose to keep the same contribution rate but shift some or all to Roth. Between contributing 6% of pay to Traditional and contributing 6% of pay to Roth, clearly contributing 6% of pay to Roth will give you more money to spend in retirement, because withdrawals from a Roth 401k will be tax free. Even making it 3% to Traditional and 3% to Roth will give you more money to spend in retirement than doing 6% to Traditional. Shifting all or 50:50 to Roth will lower the take-home pay. Even though doing 8% or 7% to Traditional will give people the same reduced take-home pay, the study showed that people are anchored on the contribution rate regardless Traditional or Roth. People choose to contribute 6% of pay because that’s the rate that gets the full employer match, or they choose to contribute 10% because that’s the rule-of-thumb they hear a responsible person is supposed to do. When some of all of the 6% or 10% is moved to Roth, they effectively increase their contribution rate without feeling they are sacrificing more of the present. It’s not rational but we don’t have to fight it. We can point out that, at the same take-home pay, contributing 8% to Traditional would be better than 6% to Roth, or that contributing 13% to Traditional would be better than 10% to Roth. It will take some explanation. Or we can just accept even though it’s not optimal, contributing 6% or 10% to Roth is still better than contributing 6% or 10% to Traditional. Whether it’s good or bad all depends on what we compare against. If people just want to check the box they are getting the full employer match or they are saving 10% like they are supposed to, it’s better to let them check the box on the Roth side. Roth 401k is better for people who have to fool themselves into contributing more. If you are more rational, just contribute more to Traditional 401k until you max out. Then you can consider shifting some to Roth 401k, but only after you also max out the Roth IRA, whether direct or backdoor, and the mega backdoor Roth if you have one available. See Roth 401(k) for People Who Contribute the Max. Hi Harry and thanks for your learned post. Those that will benefit the most from the Roth 401(k) are those long service participants in a Defined Benefit pension plan. The pension benefit when added to the Social Security check and the RMD from the pre-tax 401(k) account will catapult the taxpayer into a higher tax bracket after attaining age 70.5 than prior to that age. STRATEGY: Max out your Roth 401(k)—–if your employer doesn’t offer it—-lobby aggressively for it. I’m in the 25% tax bracket, soon to be in the 28% bracket and max out my Traditional 401(k) and Roth IRA. I then invest the tax savings from the 401(k) contributions into a taxable account. Does this sound correct? I have a Roth 401(k) option, but I think my current plan is better based on tax rates. Do you agree? I agree. I do exactly the same. I don’t use the Roth 401k because I will have plenty of opportunity to convert to Roth at lower tax rates. Completely agree on this! I have seen this hundreds of times throughout my career. I have enrolled thousands of middle class people in 401k and 403b plans. When I ask how much they want to contribute to the plan, they have a pre-determined amount in mind. Say, 6% or 3% or $100 per paycheck. For most of them, if I had to guess I would say it is greater than 80%, they don’t focus all that much on the difference in their net pay. I know that seems odd, but that is just the way people make their decisions!! When I explain the difference between Roth and Pre-tax and net pay, etc… many of them don’t care all that much. They have an amount they want to save and that is what the focus on. There clearly are a subset of people that are more interested in their net pay and are more interested in the actual comparison between pre-tax and post-tax and the long term implications of that, but I think they are in the minority. While I agree it is great to be able to tell the future and “know” your tax rates will be lower, there is half the equation you are missing and that is what happens to the money after the conversion. In order to know if you made the right decision you have to follow the money from when you earn it to when you take it from the final tax-advantaged account, which would be the Roth. You see converting to a Roth in the purely “financial sense” (ignoring other advantages you may feel the Roth gives you) is beneficial only in the sense that your tax rate would be higher at the future time when you take money out of the Roth. This would be if you feel your tax rate is truly going to go up later in retirement do to the remaining RMD’s. 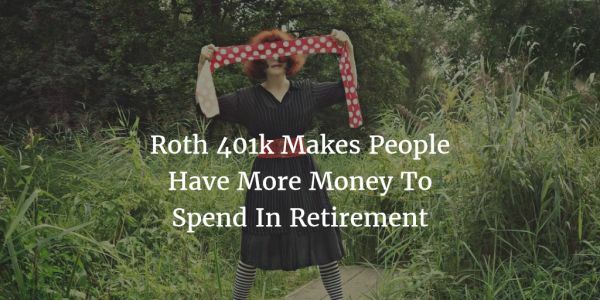 However, I do see more often than I would like people who go overboard on the Roth idea and then all of a sudden in retirement they are in the zero or 15% tax bracket, with all their Traditional IRA or 401k money gone. In other words they coverted, or spent, it all at maybe 25%, only to be in the zero to 15% bracket later. After all, many things can happen on the way to retirement. It may be that you can retire early and have many years to do conversions, but if that one thing happens that keeps you working to age 66 or 70, then you really are in a pickle if all your retirement is in the TIRA or 401k. It’s always wise to do some Roth while you are working even if it is only 10% of your allocation. Because when to convert and how much to convert are under my own control, I only have to convert when the tax rate is lower than when I was earning the money. If the tax rate is lower yet at the time I take money out of Roth, I could’ve done better but I didn’t really lose. I don’t have to wait for the absolute best time and risk missing it and ending up in a pickle. what do you mean by shifting after maxing out? I thought you only have one legal contribution amount between the two unless backdoor Roth 401K is an option. The annual maximum is $18,000. If you are only contributing $12,000 now, you keep it all in pre-tax traditional. As you have more money to contribute, keep increasing pre-tax traditional until you hit the max of $18,000. If you have yet more money to contribute, consider making some of the $18,000 Roth, such as $15,000 to pre-tax traditional and $3,000 to Roth, then $12,000 pre-tax, $6,000 Roth, and so on. That’s how you shift, with the “only after …” caveat. Your comment above seems a bit unclear, but I think what you are saying is a person can be maxed out on an $18,000 RATE until the end of the year, but it may only be the end of June and they have only put $9000 in the 401k. If that is the case they can certainly change their allocation to 100% Roth for the rest of the year and that gets them 50% Trad and 50% Roth. Obviously if you are into Dec you don’t have such a wide range of options, but you could still change it to 100% Roth and get some extra money into your retirement by paying some more tax now. Let me try again. Taking your take-home pay into consideration, if your budget only allows you to contribute $12,000, contribute all $12,000 as pre-tax. If your budget only allows you to contribute $18,000, contribute all $18,000 as pre-tax. If you can afford yet more retirement savings, contribute to the Roth IRA, either directly or backdoor. Next, do the mega backdoor Roth if your plan allows. Finally, if you still have more room in your budget for retirement savings, consider changing your 401k contribution going forward from 100% pre-tax to a mix of pre-tax and Roth, or keep it at 100% pre-tax and put additional savings in taxable. What do you think the effect of Tax Reform is in the Roth vs Non-Roth debate? Every Roth Vs Non-Roth decisioning calculation I’ve seen always starts out with “your marginal tax now vs your expected marginal tax rate at retirement”. Well, with tax reform, my “expected marginal tax rate at retirement” just went down roughly 3%, maybe a little more if you count removal of the marriage penalty. If I’ve been saving for the last 10 years in a roth 401k, didn’t I just get screwed? If I had used a traditional 401k, I would have avoided the higher tax rates of the last 8-10 years and gotten 3+% savings on the taxes I’m going to get when I retire. Whereas with my roth 401k, I paid the higher rates of the last 8-10 years, and now get no benefit of tax reform when I withdraw during retirement. Just wondering your thoughts. But yes over the last number of years, going I think way back to the 1980’s tax rates have generally been going down which has favored tremendously the IRA. It is always wise to have some tax diversity, but it can be overdone. If your tax rate for those savings was in the 15% marginal bracket it’s not too bad, but to the extent they were in the 25% or higher bracket I think it’s time to cut them off, assuming that the bulk of your money is in the Roth side of the equation. Harry has a good comment above on how to think about the order of where to put your money, which I pretty much agree with. Guessing tax rates in the future is always tricky. Whichever way you go, Traditional or Roth, you need a larger margin of error. If 3% would change your answer, you might as well flip a coin or just do a mix. I would still go with the order in the reply to Dave in comment #6.